ALERT: It’s science time again and we’re going to show you what you need to know to use your livestock to manage your pasture solar collectors so they’re always catching the maximum amount of sunlight. This beautiful shot is provided to us by the GrassWhisperer, Troy Bishopp. You really should click on it to see it full size and enjoy it. For a larger view, click on the picture. Thanks to Ozzie Abaye of Virginia Tech for this photo. We can manage how much energy we’re collecting and storing in our plants and roots by how long or short we graze in relationship to where the sun is in the sky. Removing leaves means that the plant will draw on it’s batteries to rebound. The shorter you graze, the more of your batteries, or root reserves you use. And just like your recharging any battery, the less energy it has stored, the more time it needs to recover. You can see the effect in this picture. There is a point when it doesn’t do much good to have more leaf area. As leaves grow beyond maximum light interception they shade one another, and older leaves become less efficient and die. As leaf area increases, further energy reserves in the roots return to the high level needed to sustain the next growth cycle. Beyond this point net growth is reduced and forage quality declines. That’s why it’s important for you to graze the forage. You’re helping it achieve it’s maximum growth and health. As you’ve guessed already, when the sun is high in the sky, a tall, thick pasture intercepts more light than a short, thin pasture. The light that is not intercepted by the leaves is lost to the plant. If the sun hits the ground instead of the plants, it warms the ground which may increase plant respiration. On cold spring days this could be good, jumpstarting growth. On hot summer days this could be bad, stressing plants. So as you’re managing you’ll be considering the weather as well, looking at what’s happening that day, and what the forecast is for the upcoming weeks and months. 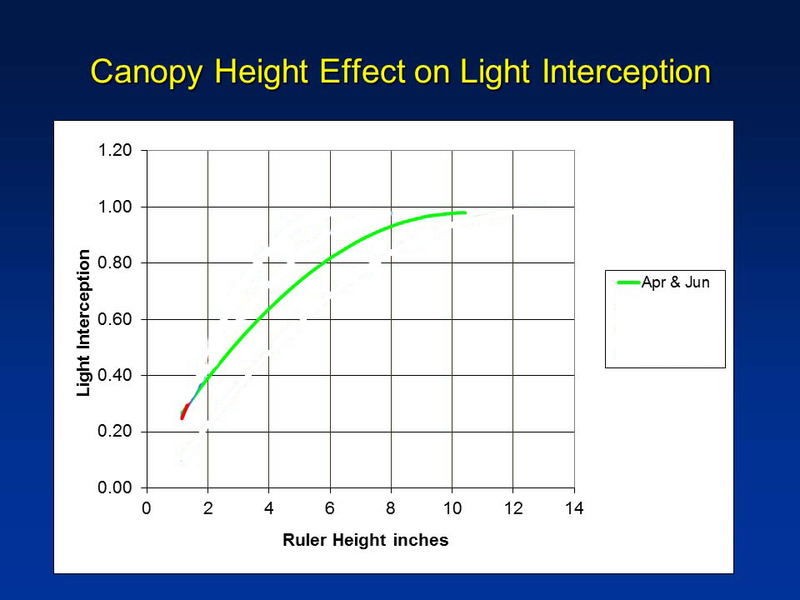 Here’s the how the canopy height effects light interception in April and June. Let’s start with April. We’ve just passed the Vernal Equinox, and the sun is getting higher in the sky. Temperatures are warming and grass is beginning to grow. 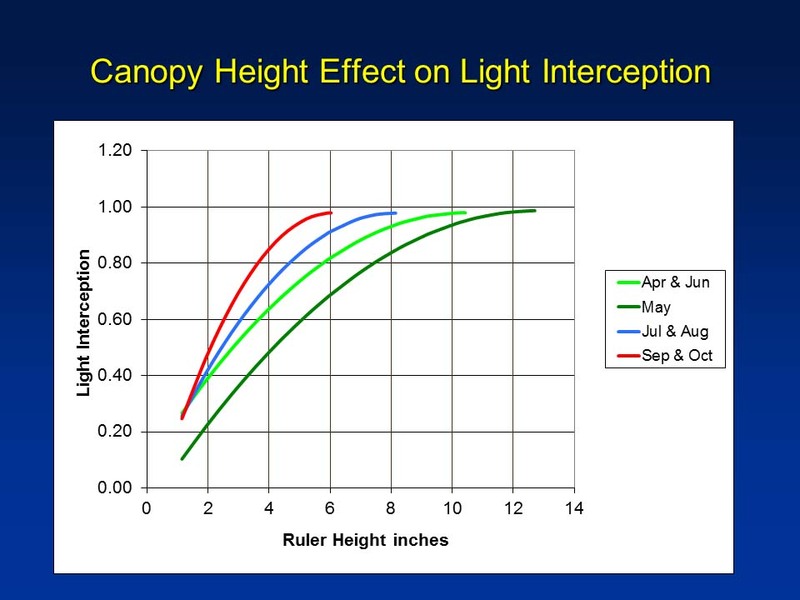 The graph here shows us that we get maximum sunlight collection with a canopy height of about 8 inches. How much of it should you graze? Well that’s where the “Art” part of the “Art and Science of Grazing Management” comes in. 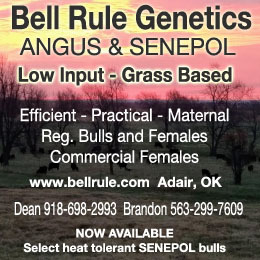 As the producer you’re going to decide based on what you need to feed your cattle, and how much rest you can give that pasture after you’ve grazed it. By the way, this light interception/growth curve is the same for June. That’s convenient for helping you plan in April what you might be doing in June. The darker green line shows canopy light interception for May. Let’s move into May now. The sun is rising in the sky even higher now, and so the plants can be even taller to capture the most energy possible. In fact, they may be taller than the maximum you need because of what happens to pasture forages in May. They start shooting grass heads up, like raising flagpoles throughout the pasture. 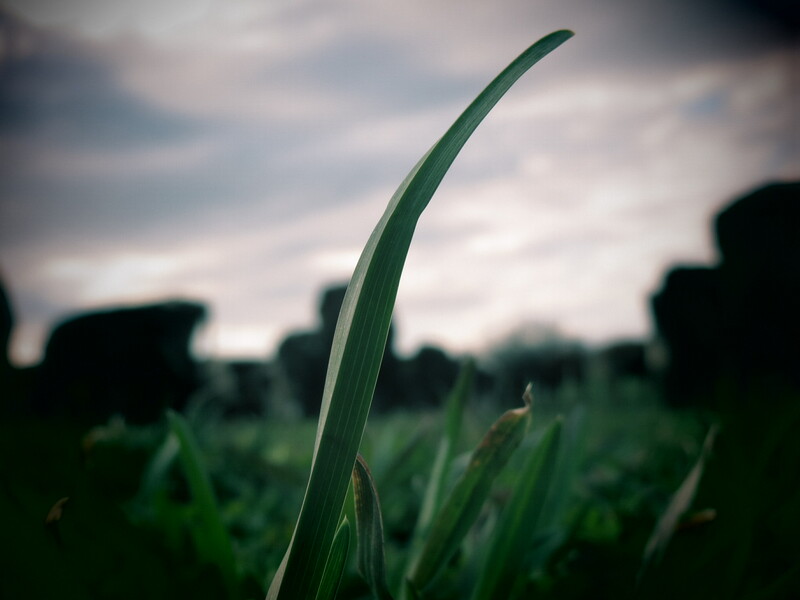 When those grass heads come out, the grass begins to “tiller” or send out more side shoots and stems, and raises leaves taller to grasp for all the sun it can get. Those taller leaves allow more light to penetrate through the canopy, so you might actually be losing some of the energy you’d like to capture and store. When the reproductive tillers are grazed down, the pasture is then mostly leaves, and the light is captured more evenly, not reaching as deeply into the canopy. Light interception by a pasture is determined by the sun’s height in the sky and the pasture’s leaf area which can be estimated by forage mass or pasture height. There’s a sort of trend there, with the light penetrating most deeply in the spring, and less deeply in fall. Here we’ve added the curves for July and August and September and October. Notice how the height of the canopy required to capture 90% of the suns rays decreases over the course of the grazing season. It turns out that the needs of the forage and the needs of the animals are well-suited to each other. Our job is to manage the time and timing in different pastures so that we’re keeping the solar collectors and their batteries in the best shape possible to do their jobs. When a plant’s leaves are grazed off new growth is powered by carbohydrate reserves and photosynthesis in remaining leaves. 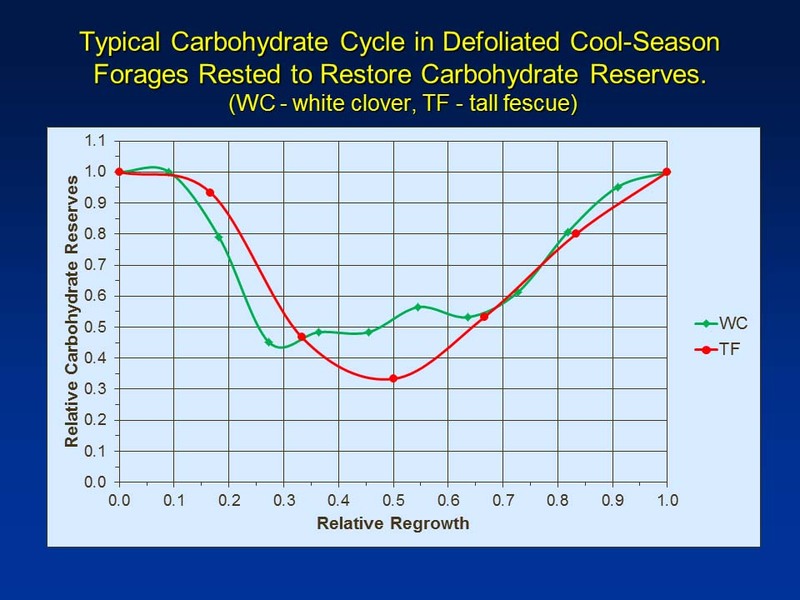 At first as new leaves grow carbohydrate reserves are used up. Latter when new leaves make carbohydrates in excess to growth needs carbohydrate reserves are restored. In many plants there is an energy reserve cycle during periods of growth after a harvest. Let’s use tall fescue and white clover as examples (Fig. 2). 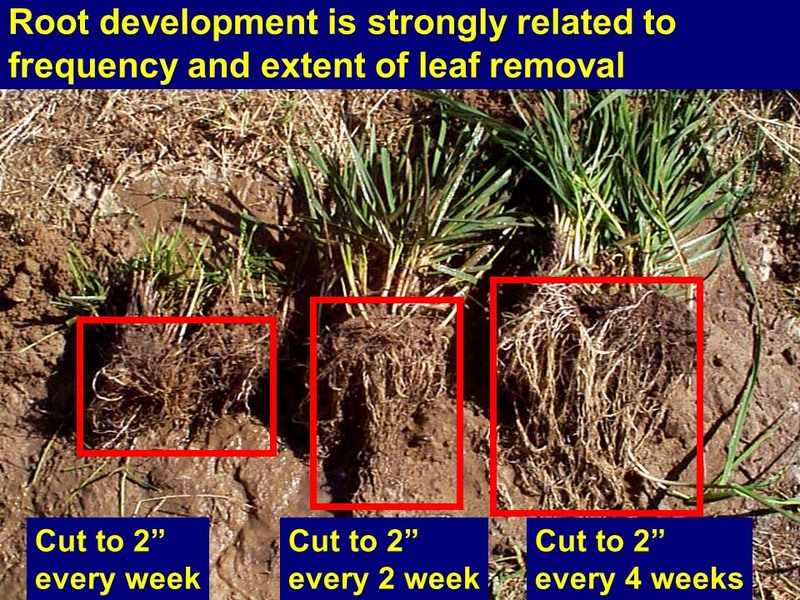 When the leaves of these plants are grazed off, new leaves start to grow. When most of the leaves are removed, energy for new growth comes from stored energy reserves. The site of stored energy reserves is species specific. Tall fescue stores energy reserves in the lower leaf sheath and underground stems called rhizomes. White clover stores energy reserves in the above ground stem called a stolon. Over a period of days the energy reserves decrease as new leaves grow. As leaf area increases, more sunlight is intercepted and photosynthesis increases, providing more energy for growth. At some point photosynthesis is great enough to produce more sugar than is needed for growth, resulting in sugar moving into storage and an increase in energy reserves in the plant. So what should you do with all this information? It sounds a little complex, but if you’ve got a rechargeable battery in anything you own, you have a good grasp of how all this works. 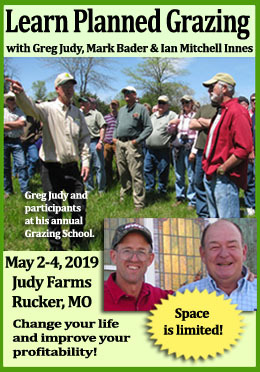 Use that experience and all your other good experience with your grazing animals to make adjustments to your grazing management that will keep your solar collectors working and your batteries charging. Next week – what this looks like under rotational grazing! I couldn’t get my fields grazed this spring, so the grass has all gone to seed. Fescue and white clover. (Today is June 3, 2013). I would really like to know if I should bush hog all of it now. If that would let it go to leaf again, ad a little material to the soil, or because the dormant time is coming, if it wouldn’t help. I’m still hoping to get enough cattle on to graze this summer. There is a small herd that I’m moving around, but they don’t seem to find this seeded grass palatable. Sorry to be so long replying but I have been out of the office most of the month. I the case you describe I think bushhogging is a good option. It will stimulate regrowth, the thatch will insulate the soil and feed the soil bugs, and allow light to get back to the legumes. Cattle do a better job but sometimes we just don’t have them where and when we need them. Thanks Ed, that’s helpful and I look forward to you next articles! Thanks for writing this, it is a great help. One question I had was what you mean by “grass head” in the 7th paragraph. Are you referring to a seed head or the handful of grass plant leaves that tend to poke up higher than others, or something else altogether? And what is it exactly that causes the tillering? 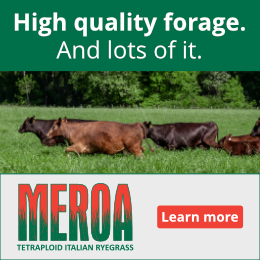 Thanks so much for contributing to this great new grazing resource! Yes, I was referring to the seed head. I will address your tiller question in our next series of articles on plant “morphology”. That is the fancy way of saying “what does the plant look like”.